There is concern that some standards of riding have not been consistently conducive to keeping us safe on the road. The large turnout of members on Sunday runs means each of the groups is taking up lengthy stretches of main roads and lanes. Consequently, it is increasingly important that we ride in a group aware of other road users and prevailing traffic conditions. The committee would like to remind experienced riders and new members of the standards we expect to keep us safe on the road. 1. When problems occur the onus is on the rider concerned to shout that they are intending to stop. The remainder of the group should try to stop in as safe a place as possible. 2. The whole group should then get bikes and bodies completely off the road. 3. When restarting the onus is on each rider to make sure it is safe to continue. 4. Too many riders move into the middle of the carriageway, trying to locate cleats into pedals and not looking where they are going. Cleats do need cleaning out periodically. 1. In situations where all riders are asked to single out (ride single file), it’s vital that all riders in the group comply. 2. If you have been riding in two’s, the inside rider moves forward and the outside rider slots in behind. In a large group it can be difficult to hear instructions with the amount of traffic noise that sometimes prevails. However, when it is self evident that the group is intending to ride single file, everybody in the group must comply. There are a lot of riders who, when talking to their riding partner in the group, consistently turn their heads at right angles to carry on the conversation. In a group at any speed it is extremely unsafe. Why? You are not looking where you are going. You all know the state of our roads. If the rider in front of you hits a pothole, potentially the whole group becomes involved. 1. The onus is on each individual rider to ensure it is safe to move in to the centre of the road to make a right turn. 2. Do not just assume it is safe because the riders in front are signalling. All riders should not crowd a junction when the group is going straight on or turning. It blocks riders’ visibility, left and right. The group will slow down or stop to allow anyone held up, to catch up. This should be completely avoided – as long as the group is riding in accordance with road conditions and the rules of the road. Because road surfaces are increasingly poor you should leave at least 2 bike lengths between each rider. This distance gives you a chance to take avoiding action should anything untoward happen in front of you. When riding in a group there is always the possibility that the group will have to slow down for oncoming traffic or other obstacles. 1. The lead riders will always shout that they are slowing down. However, the length of road occupied by the group can mean the instruction is not always heard by all riders. 3. Remember, you will probably have the rest of the group close behind you. 4. Front brake first will potentially lead to you heading over the front of the bike, or out to the side, affecting you and the remainder of the group. 5. There is also the possibility, if you have not been concentrating, that you will end up on the inside of the riders in front of you. This is an extremely unsafe manoeuvre. 6. To actively ride up the inside of other riders at any speed in a group situation, is extremely unsafe and should be totally avoided. If you have a need to ride with both hands off the handlebar (changing layers, stretching back etc) then move to the back of the group first. NEVER do this within the group. If and when you feel a need to clear nasal passages etc ALWAYS move to the rear of the group so that nobody else is affected by your discharge. Do not ride on the wrong side of the road’s centre line as oncoming traffic can pose serious danger for you and your fellow riders. When two riders drift into the space between the two bikes in front of them this may seem comfortable, but it is very annoying to following vehicles who see riders 4-abreast! Half-wheeling (where you overlap wheels with the bike in front) is extremely dangerous. Never do this. Before standing up on your pedals check the proximity of other riders behind you because you will lose speed with this action, and lose even more speed if you hesitate e.g. looking behind whilst standing up. 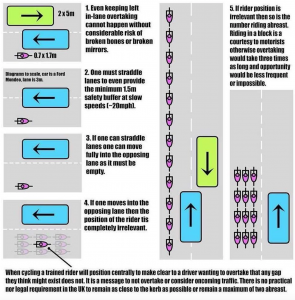 This can cause real problems for following riders who will have to lose speed – and then have to catch up! Horses have better hearing than their riders. When approaching give a loud normal voice warning “We are behind you!” and the horse will be aware of your presence. Repeat when closer so that the rider can hear and prepare. When passing give the horse a wide berth because, if startled, it will shy into you before moving away. Signals from riders in front often cannot be seen or heard at speed. Riders on the front usually have clear vision, but those behind have limited views and probably cannot see potential dangers. When the bunch spreads across the road it becomes a danger to vehicles coming up the hill. Pedestrians and horses can appear from both sides of the road, and on winding roads it is often impossible to stop effectively. The sight of a large group of riders can be impressive, but it can be intimidating when approaching head-on at speed. Road surfaces on hills can be quite variable particularly during winter months and wet periods. One small pothole, loose grit or mud can have dire consequences. Please ride to protect the group and to be respectful to other road users, particularly on steep, winding narrow lanes. Mudguards are essential kit during winter months. If you are riding without mudguards then move to the back of the group so that you do not spray others with mud and water. The wearing of helmets is obligatory on Evesham Wheelers Club runs.